Find out more about orienteering from the web (See the British Orienteering Web Site). Come along to one of our NWO events and informal activities You will be most welcome. All our events have something for beginners. 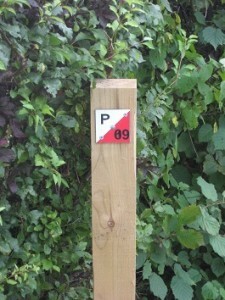 A permanent orienteering course is made up of special wooden control posts with a code number and a code letter. You can use these permanent posts to try out many different orienteering routes or courses. On an easy course, usually no more than a mile long, you will try to find from six to ten posts in order, usually following tracks, paths, ditches etc. The more advanced courses may be longer and you will try to find posts in places where you may need more careful map reading. To try any of these courses you will need to obtain an orienteering map, on which the course is marked, and a control description sheet. This describes more about where each post is (eg. 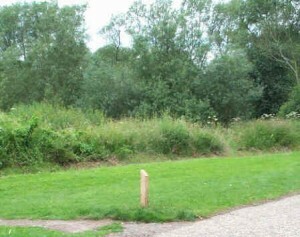 at a fence junction or on a stream bend) and the code number of the post (so that you can confirm you are at the right post when you get there). You simply write down the code letter of each post as you find it to prove that you have been there. To get an e-mailed copy of the map and instructions free of charge, please read our Terms and Conditions. Email poc@northwilts.org.uk stating that you agree with the Terms and Conditions and giving your name and the group (if any) that you represent and the number of adults and the number of children in your party. We will respond as soon as we can. Come and find out about orienteering at any of our events. Orienteering coaches and experienced club members will be there to get you started. All our events and activities are open to everyone and there will always be a course or activity suitable for beginners, families, children, individual’s and experienced orienteers with someone on hand to help. Try Orienteering An event especially aimed at anyone (individuals, families or groups) to try out one or two easy courses and find out what orienteering is all about. Members of NWO will be on hand to explain and get you started. Full Colour-Coded (Regional) Events. Eight colour-coded courses (white, yellow, orange, light green, short green, green, blue and brown) are offered unless otherwise specified. There may be additional courses and there is usually a String Course for young children. The easier courses are suitable for beginners. Urban An event in a local town using streets, alleyways, open spaces, school grounds and other urban areas. There will be an off road course for young juniors. Score Events An informal one-hour event with about 27 controls, including 7 of Yellow standard. In a score event you have an hour to find as many controls as possible. Each control earns you a number of points. Night Events These are held just after nightfall and you will need a torch (preferably a head-torch). You have an hour to find as many controls as possible. Each control earns you a number of points. There are a number of easy controls for beginners. If you are new to orienteering you may wish to try out some day events first. Summer Relay The relay is one of a series of team relay events run in the South West. A limited number of different colour-coded courses will be available for beginners and orienteers not in a team. We usually have a simple “small team” format. Training Activities There is an annual series of training sessions run by club coaches and suitbsle for all abilities. Learn about the main features of an orienteering map, such as the scale, colours and symbols. Most or all of these activities will be available at our Club Nights or other events.